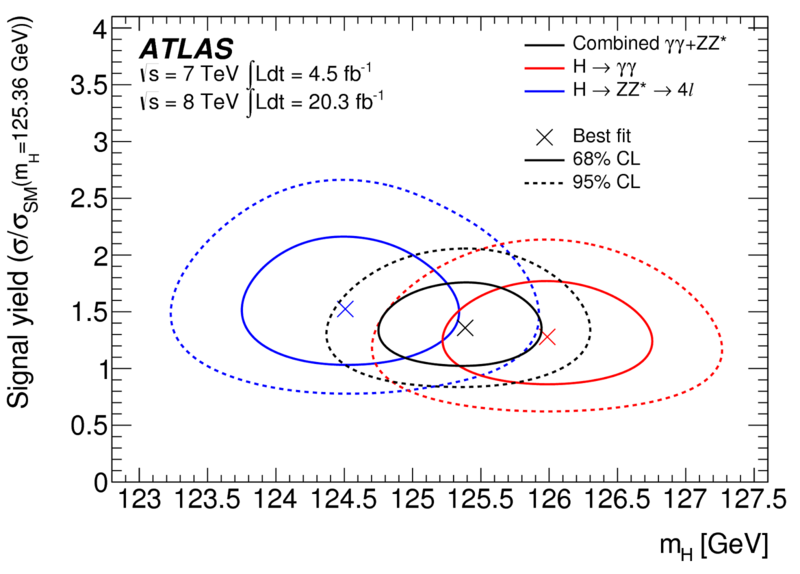 Flavor violating decay of the SM higgs in the quark sector seems possible via 1-loop. As an example, SM Higgs can, in principle, decay into a b-sbar pair throuh a W-top loop. Is there any symmetry that prevents this? I don't know how small the branching fraction would be though. Jester, could you elaborate on the specific assumptions you mentioned in the Higgs width measurement? "Nevertheless, measuring the ratio of the off-shell and on-shell Higgs production provides qualitatively new information about the Higgs couplings and, under some specific assumptions, can be interpreted an indirect constraint on the Higgs width." Why can the measurement not be considered model-independent? To interpret it as a width measurement you need to assume that off-shell and on-shell Higgs couplings are the same. As explained in 1405.0285, this assumption is not valid in general; in fact, it's generically invalid in the presence of new large contributions to the Higgs width. @Dipankar, I can't find in the literature how much is BR(h->bs) in the standard model, but certainly it's small (loop and Cabibbo suppressed) and unobservable. Indeed, it would require a tremendous conspiracy to reconcile the current data with the Higgs width larger than 1.3 the standard model one. Can you explain this comment? What about the current data suggests this? It comes from the Higgs signal strength measurements. If the width is increased, the signal strengths in all decay channels are universally suppressed, and at some point become inconsistent with the existing data. To avoid that, one would need to change other Higgs couplings in a correlated way, such that the signal strengths do not change too much. That's what I call the conspiracy. Too difficult for me, but i'm glad you're back. 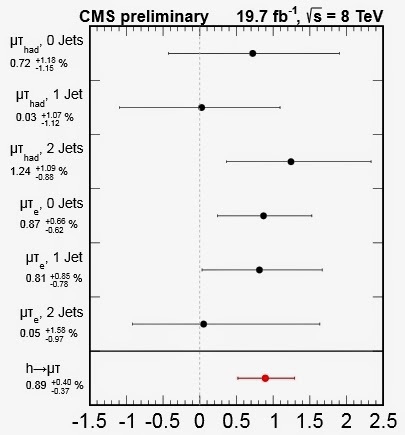 While the particulars of the relevant particle physics in this post are beyond me, I know enough to be a bit mystified by the usage of ML estimates and confidence intervals that contain non-physical values. Its not as if the problem of constructing intervals with proper coverage is an unimportant issue in statistics (see Feldman-Cousins). At a gut level, seeing some of those data points on figures for #2 & #5 make me question whether I should take the results seriously at all. Does anyone have an explanation as to why my skepticism is misplaced? There are surely people around who know much more about statistics than me and can give you a more in depth answer, but I can tell you this much: it is not nonsensical to include negative signal strengths here. What we are shown here is (more or less) the best fit of #(expected background events) + mu*#(expected higgs events) compared to #(data events). The data can always fluctuate down below the expected background, and thus make the best fit value for mu negative, so there's a real probability that mu<0 is actually measured. Thus, I would say it makes sense to include it in the range of the error bar. 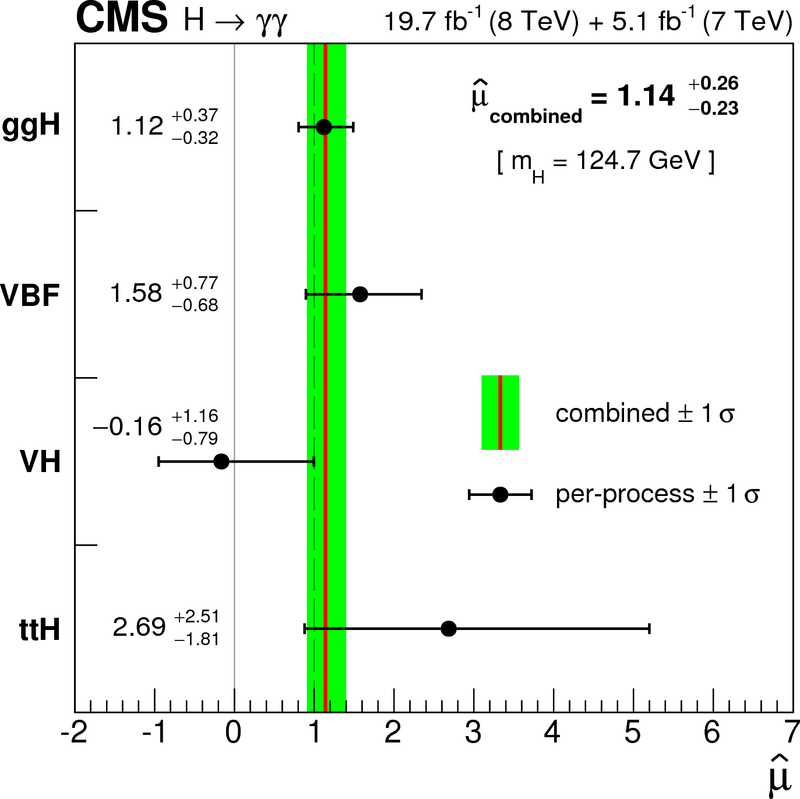 If in an extreme case we measure mu<0 with the 2-sigma error bar not even including the 0, it's either 1. the look elsewhere effect, 2. or we can assume that we underestimate the SM backgrounds and/or there is no SM higgs, or 3. there is other weird new physics interfering destructively with the background.
" At the same time, the final state is relatively simple from the experimental point of view, thus this decay may be a sensitive probe of new physics." I wouldn't agree with this statement. Measuring taus is difficult due to their pion decay modes, which are ubiquitous at hadron colliders. In fact tau are probably the most difficult particle to id. Jester, can you give any reference (may be the pdf of a talk) for the updated value of diphoton signal strength from ATLAS?